An old-school RPG with a twist? While that vague description is commonplace today, The Longest Five Minutes definitely has an interesting idea for a game. You begin at the end, specifically the final boss fight, and learn that Flash, the main hero, has forgotten everything. Faced with the final five minutes of the fight, Flash must remember everything that led him to this point if they have any hope of defeating the demon king. As a premise, it's a cool idea. There's a very basic RPG here, but broken up into small chunks that you play as the main character remembers them. Plus, I chuckle that the hero gets amnesia at the end of the game, where the trope is he/she starts with it. As you approach the end, the story pulls together into a coherent narrative. While a lot of it is pretty standard stuff, there's a few twists for good measure. Some felt a little random, though. The RPG portion of the game is mostly small sections that are a part of the overall story. If you have played any RPG, take one dungeon and the plot surrounding it. That is one memory in The Longest Five Minutes. I like that it cuts out a lot of grinding, traveling, and superfluous other things, making the game feel more concise. It's like a game without a lot of fluff. Because they are only connected through the final battle story, equipment, items, and money earned are not shared between these RPG sections. You will have appropriate equipment, but can buy some things and find some others in chests. Strangely, some chest items aren't as good as things you start with. Selling them for money wouldn't matter, so I don't know why they are even there. While initially I wanted more things to carry over, it does let you focus more on completing the dungeon than exploring every nook and cranny to find all of the stuff laying around. Plus, you aren't always going in the same direction since the story is out of order. The party's level is set based off where the RPG section takes place, but you do still get experience and money from fights. After all, it wouldn't be an RPG without that. However, since this isn't the first time you have done it, it is dubbed "re-experience". This is basically another set of levels that actually does carry through the whole game, and adds extra stat points. Many memories also have bonus missions that will give more re-experience at the end of that section. Most are things I would do anyway, but there are a few that are a pain. These involve the three mini-games during certain sections of the game. The mini-games are okay at best, but you have to get way too high of a score for the bonus. I still bothered to get them all, but it was definitely the low point of the game for me. Battles are probably the least interesting part of the game, but they aren't bad by any means. They are just very standard old-school turn-based RPG battles. You pick what action your four party members will do, then the turn plays out in order of speed. Thankfully there are little graphics for your party, and they will do some animations, so it's a definite step above something like Dragon Quest. Enemy designs are really good, too. Battles are over pretty quickly, as most take less than 3 turns. Most boss fights don't take very long, either. While the dungeons for each section look different from each other, they aren't always the best at each floor/etc. looking different. As you go through the game, the dungeons get longer, and you travel up and down floors repeatedly. When each floor looks similar to the last, it was easy for me to get disoriented and lost. I still made it through, but it could have been a little less confusing. Maybe a dungeon map would help. The non-RPG sections of the game is basically the final boss fight, and all the story that surrounds it. There are several choices you can make during it, some of which will affect the subsequent narrative. Some of these give extra or different RPG memories, while some will give you a "game over". You can save during much of the final boss story, which I didn't realize until very late in the game. It's also possible to jump back to re-do choices, and then skip forward close to where you left off. Once you have finished all of the non-ending RPG sections, you can freely jump back into those as well. It took me a bit to get it all down, but it's a very nice function that's pulled off well. 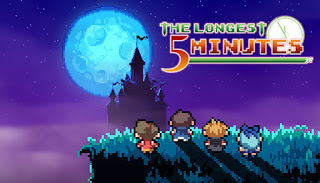 The Longest Five Minutes is an enjoyable RPG. The idea behind the game, the re-experience system, and being able to jump around the timeline are done very well, and give the game its unique flavor. Battles and dungeons were not the most interesting, thought. Still, I'd recommend the game to old-school RPG fans, as this is an interesting take on a classic motif. I'm a sucker for those nice retro graphics. The game is pretty fun, and the premise is somehow unique while feeling like a trope. Battles offer nothing new, not much incentive to grab treasure chests. Cool and unique enemy designs. Looking at the trophy list for the Vita version, it would have been another platinum if I had reviewed it instead of the Switch version.